If you have leatherjackets in your lawn, Lawn & Weed Expert can help you to get the problem under control. Leatherjackets are crane fly larvae. The fly lays its eggs in the ground – often a lawn – in August or September (dependent on soil temperature). The maggots that emerge from those eggs are known as leatherjackets, and once they have hatched, they will start to eat the grass stem and roots just below the surface of the lawn. Crane fly eggs tend to hatch during the autumn, so damage from a leatherjacket infestation may appear in November or December depending on the scale of the problem. 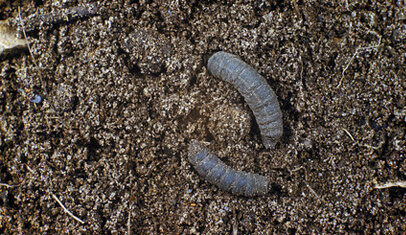 The larvae can continue to grow and cause problems all the way through winter and into early spring if left unchecked. They can strip whole lawns, turning the grass brown as they destroy the roots. The resulting bare patches can then be colonised by moss and weeds, causing further issues for your lawn. What Does a Leatherjacket Look Like? If faced with a leatherjacket infestation, call your local lawn pest specialist for assistance. Lawn & Weed Expert can be reached at 0800 111 4958 – our specialist services are available in Cardiff, Newport, Swansea, and across South Wales. Nematodes (small, worm-like insects that eat leatherjackets) may be introduced to the lawn in August or other periods of dry weather. If you believe you have leatherjackets in your lawn – or you’d like to take steps to prevent this problem – please contact Lawn & Weed Expert today. Our pest control pros will be more than happy to help.